The Dead Thing is ready for its foam rubber coat. The entire procedure can be viewed in the PREPRODUCTION folder. The Dead Thing has been committed to foam. I use GM Foam for my puppets and for Broken I purchased a new one gallon batch. Foam rubber is a very temperamental product and each new batch has its own little quirks. The process of making foam latex puppets is not overly difficult in terms of procedure but it is something of an exacting process, not to mention a nerve-wracking one. 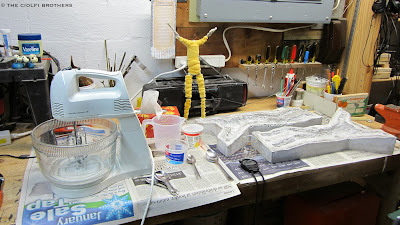 Much like mould making, I find that foaming up puppets requires patients, practise and a great deal of experience. For my previous film I created over 60 foam rubber puppets. I kept extremely detailed notes on temperature, batch sizes, humidity, time of year, etc… Keeping notes of this nature is invaluable. I was able to refer to previous puppet builds that matched my current conditions and based my new build on those notes. Making foam latex puppets is something of an art form but for me it is one of the least enjoyable procedures in stop motion film making (along with making moulds) I am happy to report that this first character was successfully extracted from its mould and is ready to be painted.